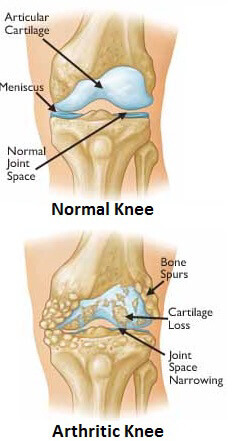 Knee arthritis symptoms vary greatly from person to person and even day to day. Some days there may be no pain at all, other days you may be in agony. You may find that there is something in particular that aggravates your symptoms, or you may feel there is no pattern at all. 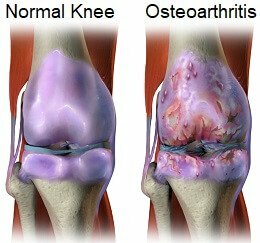 Osteoarthritis is the most common cause of knee pain in the over fifties age group, affecting approximately sixteen million people worldwide. Arthritis is commonly known as "wear and tear" and is caused by thinning and inflammation of the cartilage lining the knee joint and the associated bony spurs that develop around it, making the knee stiff and sore. Here we will look at how the most common symptoms of knee arthritis and how the disease is diagnosed. To find out more about what arthritis is, what causes it and the best treatment option, visit the knee arthritis guide. Pain is the most common complaint with knee arthritis and is typically felt when trying to fully bend or straighten the knee e.g. squatting, and with activities where lots of weight goes through the knee e.g. going up and down stairs or running. The knee is often sore when you touch it. Pain levels tend to fluctuate. People often describe arthritis pain as being like a nagging toothache. There are a number of things you can do to reduce the pain - visit the arthritis treatment section to find out more. Another one of the most common knee arthritis symptoms is stiffness which can limit how much you can bend and straighten your knee. Stiffness first thing in the morning or after prolonged inactivity e.g. sitting for long periods is a classic feature of knee arthritis. The stiffness usually eases after a few minutes of moving around. Doing gentle exercises when you first wake up or when you are sitting can really help reduce this stiffness. Knee swelling is another common feature of arthritis. The swelling tends to fluctuate and can cause pain and restricted movement. Ice and tubigrip can really help to reduce the swelling associated with arthritis. Use the links to find out more. Sometimes arthritis can cause weakness and instability around the knee, and the knee may give way at times. 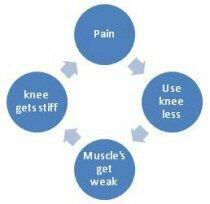 A vicious cycle often exists with knee arthritis where due to pain, we move around less so the muscles get weak and the joint stiffens. Then it hurts more so we do even less and the muscles get weaker still. Strengthening exercises for the knee muscles can help to reduce this and are one of the most effective treatments for knee arthritis. People often find their knee arthritis symptoms vary greatly. Some days they feel fine, other days they are in complete agony. If knee arthritis is suspected, your doctor will normally arrange for an x-ray which will confirm or deny the diagnosis. However, it is important to know that what the x-ray shows often bears little correlation with what people feel. For more information about this, visit the arthritis stages section. Causes of OA: What causes arthritis?